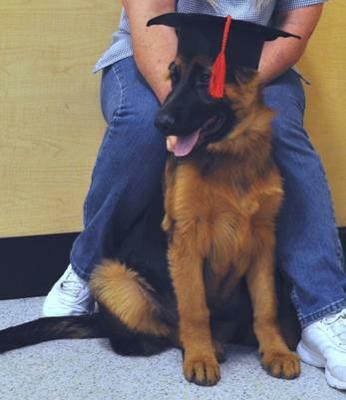 This is ‘Zeus’, 5 months old, one of my rescue puppies graduating from ‘kindergarten’. He and his brother ‘Thor’ are now in ‘intermediate’ class and are the at the top of the class! Smart AND handsome! I am so blessed that someone ‘threw away’ these pups!! Hello Barbara, and thank you so much for sharing your great story about your wonderful little German Shepherd puppy duo, Thor and Zeus. It's so nice for you taking the time to come here and sharing your German Shepherd Dog rescue stories with us all today. And I just love the picture - Zeus is so handsome and looks soooooo happy just hanging out with you at puppy class! And to all our readers - thanks so much for reading and please come back often to see what else is going on here. Let us know what you think about the above story by leaving some comments below. Comments for Head of the Class! My beautiful boy, Zeus, was shot and killed today by a complete idiot. First he shoots him with a shot gun, then bandages him and drives around looking for the owner. At the E.R. the doctor was very hopeful, but his heart could not handle the stress. He was a big beautiful baby, just 4 years old, as friendly as a dong can get. He was my best friend, companion and protector. He loved puppies and small children. If only all dogs could have such a big heart. Congratulations, Zeus. "Papi Chulo" in Spanish it's, Pretty Boy and he is!! !